The system includes usage of up to six grinding tanks. Union Process, which makes particle size reduction and dispersing equipment, says that it has supplied a custom multi-tank lab Attritor System for grinding metal powders and advanced ceramics. 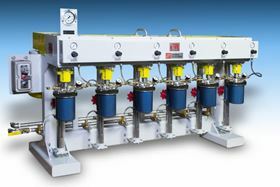 The system includes usage of up to six grinding tanks, with six agitator assemblies in a single unit. It is possible to accomplish multiple test batches under the same lab conditions, while a timing belt helps assure that all connected Attritor shafts run at the same speed for the same period of time. The Attritor features a support column to allows the user to raise or lower the tank and MECO shaft seals so powder can be ground under inert gas. Union Process’ system is powered by a 3 HP, TEFC, explosion-proof motor with a variable frequency (inverter) drive installed in a wash-down duty enclosure mounted remotely. On the machine, there is a stop/start switch with potentiometer for controlling the speed.